Miranda en la Carracaby Arturo Michelena.Courtesy of Wikimedia Commons. In Philadelphia, there is only one statue dedicated to someone from Latin America. If you look among the monuments along the Benjamin Franklin Parkway, you’ll eventually come across the statue of Venezuelan revolutionary Francisco de Miranda. The plaque tells a quick story: Miranda was born in Caracas in 1750, fought with the Spanish troops during the American Revolution, served as a general during the French Revolution, briefly led an independent Venezuela, and died while jailed in a Spanish fortress in 1816. I can’t blame you if you haven’t heard of Miranda before—though the most nationalistic of my fellow Venezuelans would no doubt be offended. They would boast that Miranda’s name is engraved on the Arc de Triomphe, and that he was allegedly a lover of Catherine the Great. Unlike many born in Spanish America at the time who either saw themselves as Spaniards born overseas or identified with a specific colonial region, Miranda saw himself as part of a single unified identity, distinct from the European, and bound by language, culture, and geography, ranging from northern Mexico to Tierra del Fuego. It was Miranda’s dream of a united Spanish American nation that inspired the ideals of Simón Bolívar. The flags of Venezuela, Colombia, and Ecuador were based on Miranda’s design. He died, filled with sadness, without seeing his dreams of independence fulfilled. His tragedy, two centuries old and so unique, feels strangely resonant and universal to me. Today, as I watch my fellow Venezuelans try to understand themselves, their place in the world, and the meaning of an increasingly-distant place we all once called home, I can’t help but wonder if his life is a warning to those who look back, an inspiration for freedom and cosmopolitan values, or just a meaningless act of Quixotic romanticism. In Venezuela, Miranda is part of our history, but he is also part of something more emotional—our national mythology—which puts Simón Bolívar at the center and Miranda as his mentor. Bolívar not only occupies a Washington-like role of Father of the Nation, his name and face are a constant, from every main street and square in every town to our highest mountain, our largest state, our main airport, and our currency. National mythologies, though, are like the statues of great men on high columns. They force you to admire them from below, but they are so far away that you can’t see the small details and imperfections of the real men. They get robbed of any semblance of humanity. When Hugo Chávez became president in 1999 and started the Bolivarian Revolution by calling himself a “son of Bolívar,” he was hardly being revolutionary. He was following our long-established republican cult, as many have before him, where all of Bolívar’s mistakes are justified, all his contradictions forgotten. Growing up—as I did—in the Bolivarian Republic of Venezuela meant spending an entire class in middle school learning about Bolívar, seeing portraits and out-of-context quotes of his speeches decorating the walls of public buildings. We even watched his remains get exhumed on live TV for the production of a CGI portrait of the “real Bolívar.” And so Bolívar became nothing but the great man in the column, Zeus in a long, monotonous pantheon of seemingly interchangeable portraits of independence heroes in military regalia. It was Miranda who stuck out. There is, for starters, an Arturo Michelena painting titled Miranda en La Carraca. Here, Miranda is portrayed in the cell where he would die. He’s not standing tall, or mounted on horseback. He appears almost humble, far from the luxurious lifestyle and the glittering personalities he was famous for keeping company with. He looks at the viewer with slight reproach. One can’t help but wonder what he is thinking as he sets his eyes on you. I can’t help but wonder if Miranda’s life is a warning to those who look back, an inspiration for freedom and cosmopolitan values, or just a meaningless act of Quixotic romanticism. A few years ago, when UNESCO added Miranda’s diary and documents to the Memory of the World Register, they were digitalized and uploaded on a website with lot of fanfare, proclaiming that these papers were available to everyone for the first time. At the time of this writing, that website is broken. Last year, I found a copy of Miranda’s papers—a collection of 24 volumes printed in Cuba in the early 1950s. They were stacked in a cardboard box filled with cockroaches that I bought from an old book peddler whose house was falling apart. It’s easy to lose myself in these diaries—even though I can only half-guess what’s written in French—because they reveal an intimate and precise view of a man who I always have regarded as exceptional but never quite human. Take, for instance, his trips to the United States. His descriptions are filled with life: He lists the names of rivers and the number of miles he travels between towns. He also talks to George Washington’s former slave at Mount Vernon. And then Thomas Jefferson insisted on showing him his two-headed snake. On his first trip in 1783, when he went from Cuba to South Carolina to New Jersey, you sense him marveling at the institutions of a strange, nascent nation. He compares a barbecue, where townspeople enjoy beer and pork and talk about politics, to Plato’s Symposium. Yet he’s candid in his criticism. He finds Americans to be overly religious and regrets that theater was banned in most of the country at the time. Despite his admiration, he complains about the cult of personality surrounding George Washington. He derides the way the people of Philadelphia greet Washington, saying that Christ entering Jerusalem looks small by comparison. During the French Revolution, Miranda was brought to trial and almost sent to the guillotine by Robespierre. In the process, he became a far savvier and more pragmatic politician. On his second trip to the United States in 1804 he went from New York to Washington, D.C. to meet with Jefferson and his cabinet with one thing in mind: to get assurance that the United States would not intervene in favor of Spain if the Spanish colonies rebelled against the Crown. Although his meetings with Jefferson were brief—and Miranda didn’t think the author of the Declaration of Independence had the right qualities to be president—he got a positive response. He then made several observations that, in retrospect, show his keen geopolitical insight. First, he realized that the United States would expand westward and eventually add Mexican territories to the union. Secondly, he realized that the United States was the only nation in the Americas capable of building a canal on the Panamanian isthmus—something Spain had tried to do, but failed. And he hoped that a united Spanish America would be able negotiate a good deal with the United States for that canal. Eventually, this trip would lead him to buy a ship in New York City. With the help of a mostly American crew, he tried to invade Venezuela in 1806. Ten Americans were captured and executed for piracy. There’s a small monument in my hometown dedicated to these Americans, though hardly anyone knows who it commemorates. In 1811, Miranda returned to help Venezuela become one of the first Spanish colonies to declare its independence, setting up a federal republic modeled on the United States. It fell apart because of factional squabbles, economic problems, and a devastating earthquake that left the most important cities in ruins. Miranda, then leader of the haphazard government, was arrested by the other patriots and given to the Spanish Crown to guarantee their safe passage into exile. 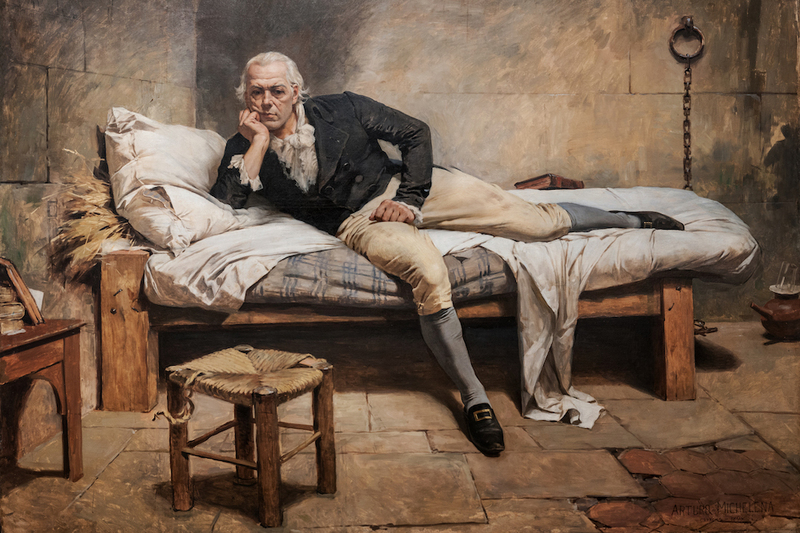 Looking again at Miranda en La Carraca, I know he always will be entangled in myth, but I can’t help but wonder what Francisco de Miranda is thinking. Today, his life feels more relevant than ever. As Venezuelans leave their country in droves, and try to make sense of their new identity as a diaspora, it’s tempting to see Miranda as a role model. Despite living less than half of his life in South America and, at different times, adopting names such as Merond, Martin, or Meroff to hide from his persecutors or to pass unnoticed in a foreign land but he was driven by his dream of seeing those he regarded as his own people be freed from Spanish rule. Both he and Bolívar met tragic ends. But while Bolívar’s fate—dying of pneumonia on his way to exile, after being expelled by the nations he had liberated—was tangled with South American independence, and carries almost the gravitas and inevitability of religious martyrdom, Miranda’s fate is Byronic. One could imagine him living out the rest of his days in his townhouse in London with his wife Sarah and his children, but instead he chose to follow his impossible dream. In that way, Miranda en La Carraca feels like a warning from a romantic, an adventurer, the father of a nation that never was, a doomed soul telling you to save yourself and never look back, because there’s nothing to salvage. But then I go back to his diaries, to his stories of escaping from the Spanish Inquisition and his quotations of John Milton, and comprehend that a lost cause is no less great, no less inspiring than one that succeeds. For many Venezuelans, our homeland is a lost cause; but for me, whether that’s true or not, it’s no reason to give up. José González Vargas is a journalist, writer, and professor living in Venezuela. He has written for Caracas Chronicles, Americas Quarterly, and NPR's Latino USA.